​latin is a foreign language? ​Teaching is like language itself. In language, there are grammatical rules, and there is the application of those rules to communication. Rules are all good and well in theory, but in the practice of communication, many factors – such as geographical and historical contexts, social background, age and gender, emotional balance, etc. – are responsible for people bending or breaking those rules. This does not necessarily constitute bad communication: rather, as the general aim of language is communication, it is inherently in flux as communication needs develop and change throughout time. Thus it is with teaching: it is important to note the difference between the theory and the practice. Pedagogical theory only represents half the story: in reality, factors such as teacher and pupil fitness levels, social background and wellbeing, interests, parental or peer pressure, etc. can impact on the learning process. If teachers digress from theory, this does not constitute bad pedagogy: on the contrary, learning – just as language – is about development and change in pupils, and so teaching needs to be adapted to the learning needs of the pupils. It is with this caveat that I would like to start our explanation about the methodology of our project. Yes, I have a general theoretical framework about primary level language learning in the back of my mind when I design lesson plans with my students. However, this is only the theory, and so only part of the story. Latin and Greek are traditionally taught either from a grammar-translation or reading approach. This means that you either teach the grammar first and then apply that grammar to texts, or you read texts and deduce the grammar from these. At secondary and university levels, both approaches are successful, and I don't want to enter into the debate of which of the two is best. At primary level, the main text books available (Minimus and Telling Tales in Latin) demonstrate that the reading approach is the favoured one for primary age teachers, and I am not aware of any primary course book taking the grammar-translation approach. 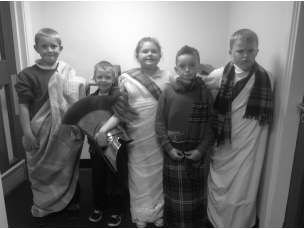 Both Minimus and Telling Tales in Latin focus on aspects of Roman (and Greek) culture while introducing some grammar; both emphasise culture as well as literacy, have online elements, and are clearly popular among pupils and successful in their aims. While their learning approach is largely traditional, they also offer advice on arts and crafts activities, gapping exercises, puzzles, storytelling, songs, and other activities that primary age children love. It is clear that teachers using either book are also developing their own creative resources alongside the books. So the reading approach at primary level (and indeed even at secondary) is never just a reading approach: it incorporates exercises and activities alongside the reading, to allow pupils to engage with the texts. Wales has a huge issue with literacy – I know it is bad throughout the UK, but Wales performs worse than the rest of the UK. Forty per cent of pupils going into secondary school are behind on reading skills, and it was clear, when I started this project in January 2012, that focusing on texts from the start would not be suitable: indeed, we were asked by the teachers again and again to slow down the pace, even when I thought we were doing very basic things. This made me realise we should really go back to basics and start with English rather than Latin, and slowly introduce Latin through simple vocabulary and sentences before we move on to entire texts. In the Communities First areas (deprived areas, with low levels of education and employment, and high levels of benefit dependency) in which we primarily teach, it was clear that simply introducing pupils to the joy of playing with language – how does English relate to other languages (primarily Latin and Welsh)? – would be a simple enough aim; actual language learning to proficient level can be kept for secondary level. It so happens that introducing children to language without aiming to make them proficient is part of the Key Stage 2 curriculum of modern foreign languages, and I started to apply this idea to Latin. It made sense to me, as our pedagogical context here is quite different from most of the rest of the country: elsewhere, Latin classes generally tend to be small in size, and focused on higher ability and/or social class pupils with adequate reading skills. In contrast, my students tend to teach groups of between 30 and 40 pupils, of varying abilities and social groups: while some pupils have excellent reading skills, others are at the other end of the scale. I don’t think Swansea is the only part of the UK that has these issues, and indeed the English and now also Welsh governments are pushing foreign languages (both modern and ancient) at primary level in an attempt to improve literacy skills. However, if we want Latin to be accessible for everyone, it might be necessary – at least for some pupils – to start at a more basic level than the reading approach. I have created a document to demonstrate how Latin fits into the National Literacy and Numeracy Framework (by the Welsh government): this clearly demonstrates how Latin learning can follow the structures outlined by the government for other subjects. The ultimate aim of Latin learning may be to broaden the next generation's cultural literacy horizon by making them familiar with other cultures and their own past to create more resilient individuals for the future. However, we can easily combine this with a more immediate aim, namely improve young people's prospects in life by improving their linguistic literacy skills, so any languages may be approached with a positive attitude at secondary level. Just as in modern languages, there is usually a theme running through an entire semester (e.g. daily life, myth, family, famous people) and this is used to explore parallels and differences between ancient and modern society: this fits in with the strong 'global citizens' emphasis at Key Stage 2. Special themes such as Christmas, Easter, mother's day, Halloween etc. get attention too, and pupils often create things to take home. There is progression from one class to the next through these themes. Every class focuses on visual, aural, reading, writing, and to some extent, kinaesthetic learning. As all learners are different, they all approach a language differently, so we take an integrative approach to teaching, incorporating different paths to the same grammar. Particularly the kinaesthetic element needs to be incorporated into classes at an early stage, and you will see that some aspects of grammar are usually taught by Total Physical Response. This is an approach to learning through which pupils connect a word/piece of grammar with a physical movement – particularly at the early stage of learning, this facilitates access to the language. We approach Latin gradually: first, we focus on Latin vocabulary alone (whether on its own or incorporated into English sentences), then the focus slowly moves to full sentences with subjects and direct objects, and only then do we move on to actual texts in Latin. As our emphasis is on literacy, language becomes important, not Latin proficiency: pupils are usually given an example of how a concept works in English before they are asked to approach it in Latin. This means that pupils are using a familiar grammatical concept in a new way, approaching it from a new angle and reinforcing their familiar knowledge. We also move from development of receptive to productive skills, and this is reflected in the format of most handouts: while pupils are first asked to complete exercises that have a correct answer, they are then encouraged to come up with their own words/sentences/texts based on the grammar learned. Grammar is usually taught through games and texts (first in English with Latin vocabulary, then later in Latin), with pre-reading activities preparing the pupils for the texts, so they don’t feel confronted with a whole chunk of text. Particularly for pupils with lower abilities or learning difficulties, doing pre-reading makes language more digestible. Texts are read out loud and often turned into a short play with props designed by the pupils, so the Direct Method is integrated into a grammar and reading approach. Using an integrative approach similar to modern MFL teaching, and using cross-curricular themes (usually per semester throughout the school) allow us to incorporate a structure which pupils are used to from other lessons. These structures help to emphasize to the pupils that the language is not as complex as they might believe. A. Ashe, ‘Latin for Special Needs Students: Meeting the Challenges of Students with Learning Disabilities’ in R. LaFleur, Latin for the twenty-first century, Glenview IL (1998), 237-50. E. Bracke, ‘Literacy through Latin in South Wales: MFL approaches to Latin teaching’, Journal of Classics Teaching (2013). J. Christie, Play and early Literacy Development, Albany (1991). D. Frost, Teaching of MFL in the Primary School, Falmer Press (1999). K. Grant, Supporting Literacy: a Guide for Primary Classroom Assistants, London (2000). J. Gruber-Miller, When Dead Tongues Speak: Teaching Beginning Greek and Latin, Oxford (2006). M. Hunt, 'Primary Modern Foreign Languages: an overview of recent research, key issues and challenges for educational policy and practice', University of Warwick (2005). C. Kirsch, Teaching Foreign Languages in the Primary School, Continuum International Publishing Group (2008). R. Masciantonio, 'Stephen Kraschen and the Classical Languages', Classical Journal 84 (1988). S. Maynard, Teaching Foreign Languages in the Primary School, Oxford and NY (2012). D. Oller, Language and Literacy in Bilingual Children, Clevedon (2002). B. Omrani, 'Teaching Latin at primary school level', Classical Resources Online (2010). R. Sparks, L. Ganschow and K. Fluharty (1995), ‘An exploratory study of the effects of Latin on the native language skills and foreign language aptitude of students with and without learning disabilities’, Classical Journal 91, 165-84. Stephen Fry and Hugh Laurie have a wonderful sketch on this topic: http://www.youtube.com/watch?v=Ij1pZvv9m0g. Barbara Bell has just published a Minimus in Practice book (2014); Lorna Robinson has made teacher resources available online: http://irisproject.org.uk/index.php/resources/telling-tales-in-latin-teachers-guide2. There is great work being done in various deprived areas around the country, e.g. in London by the Iris Project and the Latin Programme. However, such projects are still in the minority.